There are few countries in the world that compare with South Africa’s scenic splendor and diversity of leisure options: game reserves, mountain resorts, spectacular beaches and cosmopolitan cities offer a variety of experiences for all interests. The traveler can combine game viewing with wine tasting, and hiking with fine dining. The cosmopolitan cities of Cape Town and Johannesburg offer world class museums, art galleries, botanical gardens, cultural tours, music and nightlife. You can see penguins, whales, sharks and “The Big Five” all in one visit! The country encompasses a uniquely diverse variety of landscapes offering stunning scenery. The climate is sunny and mild year-round (think Mediterranean), and the country’s friendly hospitality is legendary. So whether you want to relax and soak up the sunshine at a vineyard; follow in the footsteps of Nelson Mandela; or follow a quest for wild adventure, South Africa has everything you are looking for and more. Location: South Africa is located on the southern tip of Africa. Its northern neighbors include (from West to East) Namibia, Botswana, Zimbabwe and Mozambique. Size: South Africa covers 471 011 square miles, slightly less than twice the size of Texas, or twice the size of France. Capital Cities: Pretoria (Tshwane) is the administrative capital; Cape Town is the legislative Capital; and Bloemfontein the judicial capital. Population: Around 52 million people live in South Africa. Languages: South Africa has 11 official languages (and plenty more are spoken). As a visitor on safari, you are most likely to hear Afrikaans, English, Xhosa, Zulu and Tsonga. The Flag: The present South African national flag was officially flown on 10 May, 1994 when Nelson Mandela was inaugurated as South Africa’s first freely elected president. After much debate and many design submissions, State Herald Frederick Brownell finally came up with this last minute winner (he also designed the Namibian flag). The V-shaped (green) stripe represents the two societies merging and moving forward together in unity. The other colors were all based on flags used in the past. Currency: South African Rand (ZAR) – there are 100 cents in 1 Rand and the exchange rate hovers around 10 ZAR : 1 USD. Getting to South Africa: The main points of entry from the US are Johannesburg (JNB) and Cape Town (CPT). South African Airways operates direct flights between New York/ Washington DC and Johannesburg. Delta operates direct flights between Atlanta and Johannesburg. Emirates, KLM, BA and Virgin (among others) offer one-stop options from the US to Cape Town (via their respective hubs). South African Airways has an extensive domestic network of flights to connect you to many destinations within South Africa and the region. When Sir Francis Drake rounded the Cape in 1580, he declared, “this Cape is the most stately thing and the fairest Cape we saw in the whole circumference of the earth”. Cape Town, South Africa’s “Mother City”, lies nestled between Table Mountain and Table Bay. It is truly one of the world’s most gracious and lovely cities. The city is framed on three sides by the Atlantic Ocean, the spectacular Table Mountain and the craggy Twelve Apostles. The distinctive Cape Dutch architecture, bustling waterfront of Cape Town and beautiful sandy beaches are a few of the interests offered by the Cape Peninsula. From Cape Town, one can explore Cape Point, where the Atlantic and Indian Oceans meet. The Cape of Good Hope Nature Reserve is an unspoiled stretch of land and coast with a wealth of fauna and flora. The Cape Winelands of Franschhoek, Paarl and Stellenbosch are not to be missed. South Africa produces some of the world’s best wines. The magnificent farms along the wine route are popular tourist destinations. Enjoy wine-tasting, delicious meals or even horse-riding through the vineyards. The Victoria & Alfred Waterfront has also become on of South Africa’s biggest tourist attractions. Worth visiting is the Two Oceans Aquarium as well as the Maritime Museum. Situated off the Western Cape coast, the barren windswept Robben Island was the prison home of former President Nelson Mandela for many years. It is now a World Heritage Site. Here you can experience the view that kept Nelson Mandela’s dream of freedom for his country alive. And take the cable car to visit South Africa’s most famous landmark offering magnificent views from the summit across the Cape Peninsula, Table Bay and Robben Island. The Garden Route is a magnificent stretch of coast with breathtaking scenery stretching from Heidelberg to the Tsitsikamma forest and the Storms River. This is a region of great natural beauty, creating a paradise graced with evergreen forests, lakes, golden beaches and exquisite fauna and flora, so named because this region, from Cape Town northeast to Port Elizabeth, has more plants than the entire continent of Europe. Here a Mediterranean climate prevails and unique plants and animals abound. Over 3000 plant species comprise the “fynbos” which includes the spectacular proteas and ericas. This vegetation is not found in a native state anywhere else on earth. The cities of Swellendam, Mossel Bay, George and Oudtshoorn are charming and quaint. The vast Cango Caves, reputedly one of the world’s most naturally colorful and scenic wonders, can also be seen in this region. Other attractions include the Tsitsikamma National Park with its lush indigenous forests of giant yellowwood trees and the Addo Elephant Park, known for its elephants. And along the route, a number of charming bed and breakfast country inns await. Roughly the same size as the state of Massachusetts, Kruger National Park is located in the subtropical eastern Mpumalanga region. Established by President Kruger in 1926, this sanctuary is inhabited by more species of wildlife than any other game reserve in Africa. Cape buffalo, leopard, lion, elephant and giraffe can be found along with over 460 species of bird. This world-renowned game reserve offers a wilderness experience you will never forget. View the “Big Five” by four-wheel drive vehicle or on foot in the company of a well-trained game ranger. The wilderness region surrounding Kruger National Park is made up of smaller, private game reserves. These safeguard a large proportion of the country’s wildlife resources. Luxurious game lodges and tented camps are located within these reserves and offer both day and night game viewing along with walking safaris. A large variety of animals and birds are showcased in these conservation minded reserves. Fifty kilometers inland from the cold Atlantic Ocean and south of the Orange River, is the remote region of Namaqualand. This area is world renowned for its spectacular wild flowers, making this region unique among South Africa’s natural attractions. Namaqualand becomes a paradise of flowering plants during spring (August and September) when millions of brightly colored flowers carpet the landscape and is one of South Africa’s natural wonders. Located in eastern South Africa along the Indian Ocean, Natal is the home of the Zulu and a large variety of wildlife concentrated in several small reserves. A land of towering mountains, scenic hills and valleys, this region also encompasses marine reserves, which offer important breeding grounds to several species of turtle, including the endangered leatherback turtle. The riverine floodplains are renowned as the “birding mecca” of South Africa. This region offers cultural explorations, wildlife safaris and ocean activities such as snorkeling and fishing. Visitors to the province have a chance to see and experience true Zulu culture and their proud history, interact with Indian people whose forefathers came to the province as indentured laborers and merchants in 1860 and get a taste of traditional English culture still practiced by residents whose descendants came to the territory in the nineteenth century. Built around these cultural experiences are significant tourist attractions ranging from the steamy beaches in the busy metropolis of Durban and the province’s south and north coasts to mountain resorts nestled away in the majestic Drakensberg Mountain Range. Over and above this the province also boasts a host of world-class game parks and ecotourism facilities. There are private and national reserves throughout the region of the KwaZulu-Natal. National parks such as the Royal Natal, Mkuzi, Lake Sibaya, Itala, Hluhluwe/Umfolozi and Ndumu offer every variety of game viewing and accommodation. The park offers eco-tourists some of the most diverse wildlife and outdoor experiences imaginable. Lakes, islands, estuaries, grasslands, forests, wetlands, mangroves, beaches and coral reefs all form part of this magnificent area. Wildlife include rhino, elephant, crocodile, hippo, buffalo, giraffe, waterbuck, kudu, nyala and a host of other species. The Greater St Lucia Wetland Park with its rich birdlife has been declared a World Heritage Site. Lake St Lucia is part of the St Lucia estuarine system – the largest in Africa – and was designated a Wetland of International Importance in terms of the Ramsar Convention in 1986. It is also one of five lakes worldwide protected by the Living Lakes coalition. Covering some 250,000 hectares, the Greater St Lucia Wetland Park incorporates the entire Lake St Lucia, the St Lucia and Maputaland Marine Reserves, the Coastal Forest Reserve and Kosi Bay Nature Reserve. It encompasses a great variety of habitats, including coral reefs and beaches, coastal forests, salt- and freshwater marshes, coastal plains and woodland areas. The protected area is home to the largest, southernmost population of hippos as well as prolific bird life and a wealth of other animal and plant species. Sun City, a Kingdom of Pleasure in an ancient African bushveld setting just north of Johannesburg, is a uniquely exciting casino leisure resort with sparkle, sophistication and 24 hour sizzle. It offers four choices of accommodation from the opulence of The Palace of the Lost City to the elegance of the Cascades, to the Sun City Hotel, forming the heart of the resort, as well as the more family oriented Cabanas. While surfers ride to a beach of white sand in the Valley of Waves, and golfers are challenged by the two world-renowned courses, there is also a superb range of other water and land based sports. Add superstar entertainment, a plenitude of restaurants, extensive casino gaming and a neighboring game park which boasts the Big Five, and you have the sensation that is Sun City. Game viewing is also available at several excellent safari lodges in nearby Pilanesberg Nature Reserve. The Eastern Cape is a land of rolling hills, endless sweeps of rocky coves and sandy beaches, towering mountain ranges and verdant forests, and is physically the second largest of the nine provinces. However, the main feature of the Eastern Cape is its astonishing coastline. With its wide-open sandy beaches, secluded lagoons and towering cliffs, the Indian Ocean coastline provides the province with a rich natural tourist attraction. The graceful curve of Algoa Bay provides an ideal setting for the Port of Port Elizabeth. It is South Africa’s fifth largest city and is both known as the windy city and the friendly city. Its position on the Eastern Cape coast, makes Port Elizabeth an ideal place to start or end a trip down the Garden Route or to explore the Eastern Cape. Plettenberg Bay is the jewel of The Garden Route. It’s more than a village, less than a town. Plettenberg Bay is tranquil and charming, hospitable and rather special. Originally christened “Bahia Formosa” (beautiful bay) by early Portuguese explorers, Plettenberg Bay can now be accessed by first class national roads, by sea or by scheduled air flights. “Plett”, as it is affectionately referred to by the locals, is characterized by sweeping, unspoiled, golden beaches, a dramatic rocky peninsula, intriguing lagoons and estuaries, towering indigenous forests and unpolluted rivers and sea. With its exceptional climate, and beautiful view sites over the Indian Ocean, Plettenberg Bay is perfect for tourists interested in exploring, watching or just relaxing the day away. Most overseas visitors enter South Africa via Johannesburg International Airport at Kempton Park just outside Johannesburg, the capital of the province. Johannesburg, also nicknamed Egoli (place of gold), is a city of contrasts. Mine dumps and headgear stand proudly as symbols of its rich past, while modern architecture rubs shoulders with glorious examples of 19th century engineering prowess. The busy streets ring out with the call of fruit sellers and street vendors, and an exciting blend of ethnic and Western art and cultural activities is reflected in theatres and open-air arenas throughout the city. Gold Reef City is a popular tourist attraction featuring a reconstruction of Johannesburg during the gold rush era, built around a gold mine. Visit the Victorian fun fair, miners’ houses, a brewery, pubs, a hotel, restaurants and the stock exchange. You can watch molten gold being poured, take a trip down an old mine shaft or watch the ever-entertaining traditional mine dancing. Soweto, a sprawling town outside Johannesburg, offers visitors a look into how many South Africans live. Eat mealiepap, drink locally brewed beer and visit one of the township’s nightclubs. A short distance from Johannesberg lies Sterkfontein, a World Heritage Site. The Cradle, which centers round the Sterkfontein, Swartkrans and Kromdraai cave formations north west of Krugersdorp, has for many years fascinated archaeologists and palaeo-anthropologists in the search for fossils, particularly those relating to the origins of mankind. In 1947, it yielded the skull of Mrs Ples, the first complete hominid skull ever found, and more recently, Little Foot, a 3.3-million year old ape man skeleton. Some 35 miles north of Johannesburg lies Pretoria. As administrative capital of the Republic, the city is dominated by government services and the diplomatic corps of foreign representatives in South Africa. The pace of the city is relaxed and pervaded by a sense of history. Church Square, around which Pretoria developed, was the main venue for trade, recreation and religious gatherings in the early days, and many buildings of historic and architectural importance have been retained. Pretoria is also known as the Jacaranda City, as many of its streets are lined with jacaranda trees, which in summer cover the city in hues of purple and pink. Pretoria has more than 100 parks, including bird sanctuaries and nature reserves. Pilgrim’s Rest is a living museum and a replica of the early gold-mining town. The road between Blyde River Canyon and this early gold mining hamlet is particularly scenic, and overlooks the Blyde River. Pilgrim’s Rest is rich in history, with an array of fascinating old style shops to explore. The Pilgrim’s Rest Festival is held annually in December. The lowveld area of Mpumalanga offers many other historical and scenic sights. Barberton features many reminders of the early gold-rush era. Museums include Belhaven, Fernlea House and Stopforth House. The Blyderivierspoort Nature Reserve is characterized by striking rock formations and a rich diversity of plants. Within the reserve, the Bourke’s Luck Potholes were formed by river erosion and the action of floodwater. The spectacular Blyde River Canyon is a 15-mile long gorge carved out of the face of the escarpment, and is one of the natural wonders of Africa. The canyon is the third largest in the world and hosts three rivers that feed the Blydepoort Dam at Swadini. God’s Window provides a magnificent view of miles of thickly forested mountains, the green Lowveld and the canyon. The Blyderivierspoort Hiking Trail is one of the most popular in the country. A number of other hiking trails are also available. The Lydenburg Museum is situated in the Gustav Klingbiel Reserve, which is the site of archaeological ruins from the Later Iron Age. The Mac Mac Pools and Falls outside Sabie are also worth a visit. Mount Sheba Nature Reserve, south of Pilgrim’s Rest, is best known for its indigenous forest – one of the few left in the region. Sabie is the centre of the largest man-made forest in South Africa. The Cultural Historical Forestry Museum depicts various aspects of the country’s forestry industry. The Bridal Veil, Horseshoe and Lone Creek Falls just outside Sabie are worth a visit. Guided tours of the Sudwala Caves are offered seven days a week. Mpumalanga – “the place where the sun rises” – epitomizes every traveler’s dream of Africa in the true sense. The province is situated in the northeastern part of the country and borders both Mozambique and Swaziland. It is mainly situated on the high plateau grasslands of the Middleveld, which roll eastwards for hundreds of miles. In the northeast, it rises towards mountain peaks and then terminates in an immense and breathtaking escarpment. In some places, this escarpment plunges hundreds of feet down to the low-lying area known as the Lowveld. Long sweeps of undulating grasslands abruptly change to the thickly forested ravines and thundering waterfalls of the Escarpment, only to change again to present the subtropical wildlife splendor of the Lowveld. Mpumalanga is an area of immense natural beauty and diversity – a land of mountain splendor and wide horizons, of forests and plains, rock formations and caves, waterfalls and majestic mountain scenery. Mpumalanga is an African landscape where wildlife still roams on bushveld plains and where the visitor can experience the true mystery of Africa in near pristine surroundings. The Northern Cape province lies to the south of its most important asset – the mighty Orange River – which provides the basis for a healthy agriculture. The Northern Cape is a place of vast arid plains with outcroppings of haphazard rock piles. The cold Atlantic Ocean forms its western boundary. This region covers the largest area of all the provinces and has the smallest population. The major airports are situated at Kimberley, the capital, and Upington. The Northern Cape is serviced by an excellent road network, which makes its interior easily accessible from South Africa’s major cities, harbors and airports. If you are looking for a unique traveling experience, the Northern Cape is the ideal place to take time out of your busy lifestyle – enjoy the freedom of the wide open spaces, the fresh clean air and the friendly, down-to-earth people who give this Province its warm and welcoming atmosphere. Whether you intend to experience the beauty and tranquility of our numerous nature reserves, the adventure and excitement of 4×4 routes, hiking trails, river rafting expeditions, the waterfalls, the world renowned flowers of Namaqualand or the richness of our diverse cultural heritage, the Northern Cape has something unique to offer you. The North West Province has as its northern neighbour the Republic of Botswana. Rolling fields of maize, golden sunflowers and vast areas of bushveld covered in thorn trees stretch as far as the eye can see. It is one of the smaller provinces and is completely landlocked. The North West falls almost entirely within the savannah biome (bushveld), with the exception of the southern part, which is part of the grassland biome. The North West Province provides the perfect tourism package for nature lovers. Leading the weary city dweller away from the hustle and bustle of everyday life, this province offers an escape route to the real Africa… a land of peace and tranquility where nature’s wild creatures roam vast plains of scenic African bushveld. Some of the biggest tourist attractions of the province are the Pilanesberg National Park, the Madikwe Game Reserve, Sun City and the Lost City. The Northern Province portrays the quintessence of untamed Africa – ancient baobabs guarding vast expanses of mountains and bushveld, offering a mosaic of tourist attractions. There are many archaeological sites where the mysteries of the past and ancient peoples are still haunting this harsh landscape. From the great Bushveld with its prolific wildlife in the west to the lush valleys of the Lowveld in the east, it is a part of the country every tourist should visit. The Northern Province lies within the great elbow of the Limpopo River, and is a province of dramatic contrasts – from true bushveld country to majestic mountains, primeval indigenous forests, latter-day plantations, unspoilt wilderness areas and a patchwork of farming land. The Northern Province is the gateway to the rest of Africa. 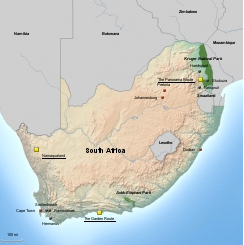 This province is in the savannah biome; an area of mixed grassland and trees, which is generally known as bushveld. A trip through this summer-rainfall area soon convinces one that this is tree country. The biggest section of the Kruger National Park is situated along the eastern boundary of Northern Province with Mozambique. The Drakensberg is the country’s most impressive mountain range and a very popular holiday destination. In the perpetual process of creation, the principal tools of nature have always been water, temperature and wind. In the Drakensberg, still retreating before those erosive forces, the spectacular results of their combined onslaught is clearly in evidence. Peaks, pinnacles, towers, spires, domes and walls make up the forbidding dragon’s back of Quathlamba, the Barrier of Spears. The Drakensberg extends south from Mpumalanga ending in the north of Eastern Cape Province, but the heart of the range is the KwaZulu-Natal Drakensberg. Sightseeing and hiking are main activities, but there are many others. Horseriding, fly-fishing, game viewing, mountain biking, kloofing, abseiling, rock climbing, birding, and 4×4 driving and are other options. Nestled at the foot of these mountains are numerous fine hotels and holiday resorts. Durban is one of the fastest-growing urban areas in the world. It boasts the busiest harbor in South Africa, which is also one of the 10 largest in the world. Durban’s beachfront is also known as the “Golden Mile”. This stretch of golden sand is Durban’s main attraction. Indulge in swimming, sunbathing and other water sports. Luxury hotels, markets and amusement parks are found along the beachfront and there are a variety of cultural and sightseeing tours available. While safaris have traditionally been ‘all about the animals’, travelers can now truly “rough it” in style ~ having all their creature comforts and the best in wildlife viewing as well. Accommodation in Africa can range from lavish and luxurious to clean and comfortable. Take a minute to browse through the pictures and descriptions of these accommodations to get a sense for what style appeals to you. Our approach is not to take a packaged tour ‘off the shelf’ and expect it to work for everyone. Instead we believe that each of our clients plays an important part in the planning of their own adventure. To begin with, you can review our suggestions either by the country that interests you or by the type of safari you are looking for, and we can then tailor it to your liking.